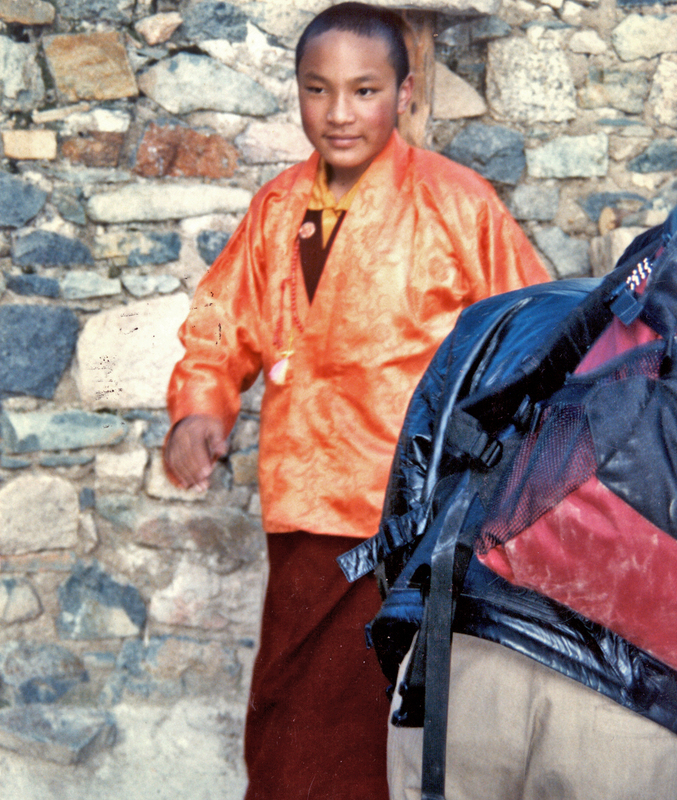 In 1995, at the request of my dharma teacher, I took my family on a pilgrimage to Tibet to see the 17th Karmapa, Orgyen Trinley Dorje, the young Tibetan lama that the Eddie Murphy movie "The Golden Child" is said to be patterned after. Like the Dalai Lama, the Karmapa is the head of one of the four main lineages of Tibetan Buddhism. At that time the Karmapa was 12-years old, but his incarnation goes back seventeen generations. In fact the Karmapa Lineage was the first of Tibet's reincarnated lamas. The current Karmapa is the 17th, while the current Dalai Lama is the 14th. I had no real idea how this trip would affect me. I will pick up the story from the point where we actually arrived at the Karmapa's ancestral home, Tsurphu Monastery in the Tolung Valley, deep in the mountains of Tibet at some 15,000 feet in altitude. There I sat, with my wife, two of my daughters, and my son in a little room waiting to see the Karmapa. We were about to spend three days there as the Karmapa's guest. Every day at 1 PM the Karmapa has a public reception, where a procession of visitors file up, offer a white scarf, and get his blessing. We wanted to do that too, but were told to wait and that he would see us privately. We had come with letters of introduction from a number of high lamas. It seemed that from the moment we arrived, all the monks there knew we were Khenpo Karthar's students. We could see them whispering. We belonged to Khenpo Rinpoche and they seemed to know exactly who that was, all the way to Tibet. The time ticked away on the slow track as we waited with anticipation to see the Karmapa. I had last seen His Holiness in 1974, but in his previous incarnation as the 16th Gyalwa Karmapa, Rigpe Dorje, and I felt like I had been in endless touch with him through the lineage all this time. Like the Dalai Lama, the Karmapa is the spiritual leader of an entire lineage of Tibetan monks, one most famous for its yogis and meditators. Until one month before, we had little hope of ever seeing the Karmapa, since it was very uncertain when the Chinese would ever let him leave Tibet. He was essentially a prisoner in his own monastery. And now, here we were at his ancestral home, about to meet him in person. At last, the summons came. The Karmapa would see us now. So off we went in single file toward his interview room, some two stories up from where we were. And I was right in the middle of the worst of my altitude sickness, still sick and getting sicker. I don't do well at high altitudes, slipping into bronchitis, having to go on antibiotics, and all of that. As I climbed the steep stairs toward His Holiness I had to stop and do heavy breathing, just to keep enough oxygen in my lungs. Every few steps, I would find myself gasping for breath as I climbed upward toward the interview room. And please understand that the average Tibetan stairway is more like a ladder (like on a boat) than the kind of stairs we are used to, and steep. You literally hang on and climb. We eventually came to a small courtyard in the open sun outside His Holiness' room, where we took off our shoes. I actually had to sit down and pant. How embarrassing. And then up another short ladder to the interview room itself, where I arrived, still trying to catch my breath. I plopped down at the back of the room, while everyone else was up front prostrating to the Karmapa. I was so bushed that I did not (at first) remember to do the three traditional prostrations that practitioners do before any great lama. All I could see was this young man kind of inset into this wall of golden brocade at the far end of the room. I slowly moved forward. Through the 1960s and onward, in my quest for spiritual teachers, I had seen many gurus in person, and so was preparing myself to actually be in the presence of the Karmapa. In the past, when I met great spiritual presences, most were imposing, some almost regal. I was very much preparing myself for a similar experience here, you know, me seeing them, but the Karmapa was different. In the end, in his presence, it was me that I saw, not him. Here is how that happened. As I reached the front of the room, there was the Karmapa, looking better than I could even imagine, and I had imagined he would be great. All of 12 years old (by our calendar) and five feet tall, but seeming seven feet tall and ageless, he filled the room with his presence. All I remember is how happy I was to see him, like a child sees his mother. I remember kind of getting through my prostrations and fumbling to offer him a white scarf, while kneeling down before him. He looked at me like I had never been looked at before. His eyes look straight into my eyes and then he ups the ante by focusing intently within me. I was being seen. His dark eyes, almost like the ever-adjusting lens of an auto-focus camera, were actually moving in and out, trying to get the right focus. I have never seen eyes do that, be able to lock gaze with you and then, with the gazed locked, still move in and out, getting a fix. But, that was just how it was. The Karmapa examined me for a few seconds and, in the grip of his eyes, it seemed as though time stopped, and then all relaxed and time moved on again. He placed the white scarf over my head, gave me a welcoming, kind look, and I sat down in front of him with the rest of our group. There was chanting going on. Gradually I realized we were in the middle of the Mahakala puja, perhaps the most important daily practice for the Karma Kagyu Lineage. Later we found out that we were experiencing a special form of Mahakala, one for insiders, complete with Tsok, the ritual feast offering. Karmapa was sharing this with us. It was very intense, with His Holiness leading the chanting with an intent and often fierce look. Mahakala is a wrathful practice, as some of you may already know, one invoking the protector deities. And this one was complete with drums, cymbals, and the various Tibetan horns. I had experienced the Mahakala puja before, but never one quite like this, certainly not one with the Karmapa himself leading it! And I don’t really know how to describe what happened next. I begin to identify with this puja as not much different from my own practice in many ways, and I found myself examining just where I was with my daily practice, and what it was all about for me. I had done it, without fail, every morning and afternoon/evening for many years. I was to do it until my death or until I completed it by realizing the essential nature of my own mind, whichever came first. Now, here in the midst of Karmapa’s mandala, I began to explore the true meaning and nature of that practice. What was that practice and what was the essence of it? I thought how in my own idea of myself, to my mind I was somewhat of a tough character and I carried that strength or toughness to my practice. In fact, I loved the fierce wrathful deities, somehow identifying with them. And now, there in that room with Karmapa, that same strength, toughness, or we might even say fierceness came up in the mind and began to be examined inwardly, but in a new light. And this was no idea that I was playing with. Instead, I was examining myself or, to be more exact, I was realizing part of my self, in this case, that part that had been practicing all these years, the one who did the practice. And as this realization took place I saw how my fierceness or toughness was but a shell or shield covering up this extremely sensitive inside. I was tough, because I was so…so sensitive and, at heart, even kind. In that moment I was flooded with a state of compassion or rather the realization that I was (and always had been), at my deepest part, compassionate, concerned, and caring, and that this was my natural state. It was not something to strive for, but already in fact always the case – the state of my very being, something that only had to be uncovered, opened up. I did not have to strive to be compassionate, for that was already my natural state. All I had to do was to let go of what obscured this insight, relax, and let it shine through. Again, I should point out that this was not a concept or idea, but a realization that totally involved me. I realized that the essence of my practice, of my fierce presence, was none other than compassion. It was as if, like taking off a glove, I had turned myself inside out. Tears just flowed as I was overcome with this, now so obvious, realization that I was, in essence, very simple – just a soft-hearted, easy mark for this world. I was easy and all of my toughness, my fierceness, was nothing more than an attempt to cover over and shield myself from responding too much to all the suffering I saw around me. In that moment, I understood myself and my practice, right in midst of that Mahakala puja with Karmapa. I was at peace. And later, when we left the Karmapa and very slowly drove back down 40-miles on a road that was not really a road at all, we saw rainbow after rainbow after rainbow. So that is what Karmapa was about to me, not some powerful being sitting on a throne. Rather, there was enough space and time within his mental mandala and presence for me to realize myself. It was not the Karmapa I saw when I was with him, but myself. That is my definition of a spiritual being, one who helps me realize myself, not who they are. After the puja, we spent some time together with the Karmapa during which he gave the answers to the questions that we had brought to him. He did not skirt the tough questions, but was clear and unequivocal in his answers. I was deeply relieved, both from the experience I just described and to hear the various particular answers. And later, he came out in the courtyard and just kind of hung out with us. After all, my son Michael Andrew was about the same age. I doubt that very many western families with kids had ever made it to Tsurphu Monastery. I had heard many stories about His Holiness, both this incarnation and the previous incarnations, stories of amazing actions, all pointing to this extraordinary being. Somehow these stories help to inspire faith and confidence in the Karmapa, that he is who he is -- that sort of thing. Yet these stories were nothing compared to the sheer largeness of his presence. And this kind of thing defies words. How do you explain that when you are in the presence of His Holiness, you have a different idea of yourself, of who you are, why you are here, etc.? I learned things about myself when I was in his presence that I never knew before, important things. The word is "realization." I realized things about myself that I had never realized before. And I understood why my teacher, Khenpo Karthar Rinpoche, wanted us to go to Tibet and meet the Karmapa in person. It occurred to me that if I could start my life over, I would drop whatever I was doing, go and see the Karmapa in person, preferably in an interview. And only after that would I pick up my life again. I didn't understand who I was or how best to make use of my life until I met His Holiness. In the beginning, phrases like "His Holiness" and "guru" were literally foreign to me and smacked of exotic cults and all of that stuff, a hangover perhaps from the New-Age fads of the 1970s. But meeting the Karmapa, eyeball-to-eyeball, was not foreign at all. It was only too familiar, like knowing myself finally for who I am, confirming who it is I always hoped I was.